I also tried Victory’s Hop Ranch. I enjoyed this a lot and would definitely drink this again and again. It’s not quite as strong as Hi-Res at 9% ABV, but it drinks much lower than that. It’s an easy beer to describe: Pineapple juice. It’s like someone juiced an alcoholic pineapple into my glass. It even has the same appearance as pineapple juice. I really like that Victory is putting out some new Imperial IPAs like this and DirtWolf, which is probably my favorite of their beers. I hope both Hop Ranch and DirtWolf stay as year-round offerings from Victory. Good work, people who make beer there! 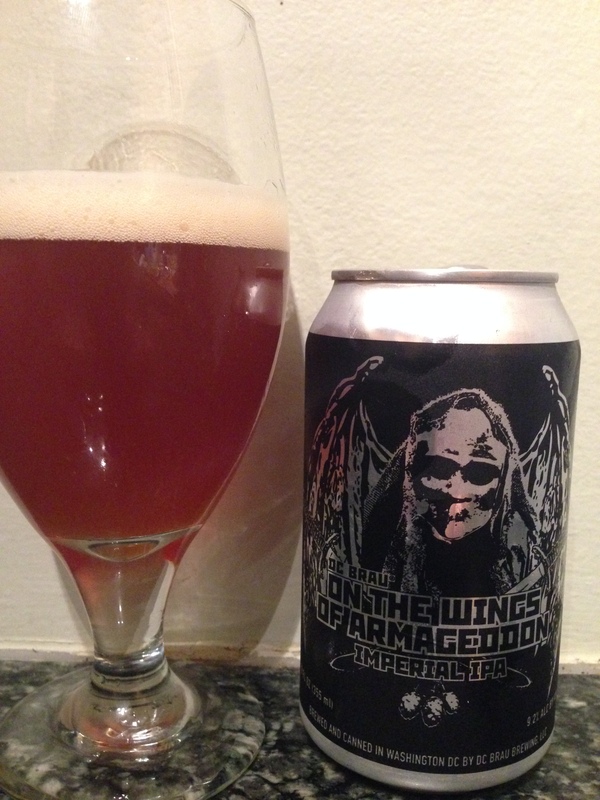 Another great Imperial IPA that I’ve had recently is DC Brau’s On the Wings of Armageddon. A friend of mine from the DC area brought me a six pack. Hi-Res has almost the same flavor profile as this (they even look similar). Both taste like juicy tropical fruit punch. The can is super scary looking, but the beer is super delish.